Kenji Mizoguchi made 75 films in his career, from 1923 until his death in 1956 from leukaemia, aged 58. He is considered as one of the three most important Japanese directors from the 20th century, together with Akira Kurosawa and Yasujiro Ozu. At one point he was considered the most eminent Japanese director during the 1950s. This was due to the support of the French Cahiers du Cinema critics who championed his films. Mizoguchi won the Silver Lion award at the Venice Film Festival for three years in a row from 1952 to 1954 for The Life of Oharu, Ugetsu and Sansho the Bailiff. Mizoguchi's critical reputation has waned since the 1950s, only enjoying a resurgence in the DVD age. Kurosawa and Ozu may be more readily known in the west due to their stylistic films (Kurosawa made many Samurai period films, Ozu made films centring around contemporary family life) whereas Mizoguchi's films were more varied even though Mizoguchi mainly shot period films with distinctive themes. The main themes that Mizoguchi focused on in his films were freedom, poverty and the role of women in society. Sansho the Bailiff certainly explores these themes, in a profound and moving way. You certainly will not forget this film once you've seen it for it is an overwhelming tale of compassion and mercy in the midst of unjust suffering. Set in the late Heian period in the 11th century, the film begins with the forced exile of the Governor of Tango by a feudal lord for treating his peasants too kindly. He is separated from his wife, Tamaki and his son, Zushio and daughter, Anju who go to live with his brother-in-law. Before this we see him teach his son the virtue of compassion and forgiveness, "A man is not a human being without mercy. Even if you are hard on yourself, be merciful to others." This teaching will have a great impact on his son, Zushio by the end of the film. After six years the family is forced to leave when Tamaki's brother marries and they are unable to find a room for the night on their journey to meet their exiled husband and father. A priestess appears offering accommodation and travel in the morning. The next day they are escorted to the lake whereby Tamaki is separated from her children as the family is kidnapped and taken as slaves. Tamaki is taken to the island of Sado and sold as a prostitute, whilst the children are taken to the private estate of Sansho the bailiff in Tango province for hard labour. Once there, they witness the brutality of the bailiff, who brands slaves on the forehead if they try to escape. The children are helped by Taro, the bailiff's son, who understands that Zushio and Anju do not come from a peasant background when Zushio recites to him his father's teachings. He renames the kids to protect their identity, and then leaves his father's estate to become a Buddhist monk. Ten years pass and we see Anju holding on to her father's teachings whereas Zushio has changed, trying to gain Sansho's loyalty by pleasing him, even if it means branding a seventy year old man. When Zushio is ordered to dispose of a dying woman, Zushio and Anju find themselves with an opportunity to escape. She convinces him to do so on his own and tells him to go the Buddhist temple nearby. Zushio takes the dying woman with him and, unknown to her brother, his sister commits suicide rather than give away the details of her brother's whereabouts under inevitable torture. After finding and conversing with Taro at the monastery, Zushio plans to visit the emperor's adviser but finds himself arrested, however the adviser remembers his father and subsequently makes Zushio the new governor of Tango. As Governor, Zushio issues a decree outlawing slavery. He has Sansho exiled and immediately resigns. After freeing the slaves on the estate he re-unites with his mother on Sado Island, who is now blind and decrepit due to having her Achilles tendon cut after an attempted escape years before. He explains to his mother that his resignation was due to his father's teachings. We see certain mise-en-scenes repeated in the film. When the children chop wood at the beginning of the film it leads to their capture, later chopping wood will lead to their escape. The Governor of Tango is exiled without his family, whereas Sansho is exiled later with his family. Taro renames Zushio to protect his identity, again later we see the emperor's adviser rename Zushio when he becomes the new Governor of Tango. There are many poignant shots of water, as there are in all Mizoguchi films, signifying not a life-giving resource but a symbol of the suffering of life. The shot of Anju walking into a lake of water, with its concentric ripple effects, as a sacrifice for her brother's life is one of the most beautiful scenes ever shot in all of cinematic history. The sky, symbolising hope, is only seen at the end of the film when Zushio re-unites with his mother after many years of separation. Sansho the Bailiff is one of the most moving, sad and aesthetic films you are ever likely to see. The plot, cinematography and soundtrack all capture a quality of beauty unique to cinema that is rarely seen, this film is truly a powerful masterpiece. The Life of Oharu may have been Mizoguchi's favourite film, and Ugetsu is often cited as his critically espoused work, but Sansho the Bailiff will be the one Mizoguchi film which will impact you the most. The video transfer is exemplary. It is a port of the restored Region 2 2007 Masters of Cinema release on DVD. The Region 2 version of Sansho the Bailiff is in its original NTSC format. The Region 4 release has been converted to PAL, hence the reason why it is 5 minutes shorter. The main feature takes up 5.9gb of space on a dual-layered DVD with an average bitrate of 6.77 m/b per sec, which is excellent for DVD. The aspect ratio is 1:33:1 full-frame, not 16x9 enhanced for widescreen televisions. The transfer is incredibly sharp and detailed for a film of its age. This may be one of the best black-and-white transfers I have seen on DVD. The contrast fluctuates only slightly sometimes during scene changes, otherwise the different tones of black, grey and white are rich and distinctive. The outdoor, on-location cinematography reminded me of the cinematographic work on Akira Kurosawa's 1950 film, Rashomon. There are maybe two instances where we get visible scratching on the transfer, otherwise there are no film artefacts. Film grain is also not evident as is usual for a film from this era. The default subtitles are in white and are easy to follow. A choice of alternative bold and yellow subtitles is also available. The RSDL change occurs at 72:07, unfortunately in the middle of a scene. The audio transfer is not as near-perfect as the video transfer, but it is still good. There are two Dolby Digital 2.0 tracks on the DVD, one for the main Japanese soundtrack and one for Ross Gibson's audio commentary. Both tracks are encoded at 224 kbps. Dialogue is clear and synchronised. There is a slight background hiss throughout the film. The soundtrack by Fumio Hayasaka, Tamekichi Mochizuki and Kanahichi Odera is traditionally Japanese, with a flute and harp-dominated score. The opening credits however feature a Hollywood-influenced melodramatic string score, perhaps as a guide for the audience to set the tone of the film. There is no surround channel usage as the main soundtrack is mono. The subwoofer is not utilised either. Ross Gibson's tone of commentary might not match fellow critic Dr. Adrian Martin's, but he nevertheless provides an informative commentary to aid the viewer in their understanding of Mizoguchi's cinematic style. Gibson references Mizoguchi's mise-en-scenes, his love of the long take and of diagonal movements across the screen. He points out scenes which are repeated in the narrative and the symbolic meaning of the different changes in name of the main characters, There are also references to the scenic use of water, wind and fire. This commentary is a decent introduction to those who are unfamiliar with the cinema of Kenji Mizoguchi. There is an option to view the original Japanese theatrical poster. Four trailers are included for Jafar Panahi's Offside, The Tarnished Angels by Douglas Sirk, The World by Jia Zhang-Ke and Tokyo Story by Yasujiro Ozu. 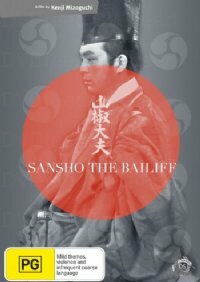 Sansho the Bailiff was first released on DVD for English-speaking audiences in 2007. In that year Mizoguchi fans were treated to two spectacular releases, one by the Criterion Collection in Region 1 and one by Eureka's Masters of Cinema label in Region 2. The Region 1 Criterion Collection release included a video transfer which was darker in contrast to the Region 2 release which made it slightly sharper, although it is window-boxed. It also includes an audio commentary by Japanese literature professor Jeffrey Angles, video interviews with actress Kyoko Kagawa, first assistant director Tokuzo Tanaka and film critic and historian Tadao Sato and an 80-page book, featuring an essay by scholar Mark Le Fanu and two versions of the story on which the film was based: Ogai Mori’s 1915 Sansho Dayu, in an acclaimed translation by J. Thomas Rimer, and a written form of an earlier oral variation, in a new English translation. The Region 2 Masters of Cinema release included a full-frame transfer, a discussion on the film by renowned film critic Tony Rayns and an 80-page booklet containing cast and credits for Sansho the Bailiff, Mizoguchi: The Ghost Princess and the Seaweed Gatherer, an article by Robin Wood discussing Sansho the Bailiff and Ugetsu originally published in Film Comment March-April 1973, Sansho Dayu: Story and Film, extract from Mark Le Fanu's book Mizoguchi and Japan and Sansho Dayu by Mori Ogai, translated by J. Thomas Rimer, the 1915 short story on which the film was based. Also included is the Mizoguchi film Gion Biyashi on another disc. If you are familiar with this film you will no doubt own the Region 1 Criterion Collection version of the film, as I do. Otherwise, the Region 4 release, while not as extensive with extras as the Criterion and Masters of Cinemas releases, does still have an exemplary video transfer and an audio commentary. If Jean-Luc Godard called Kenji Mizoguchi "simply one of the greatest filmmakers" then that should be enough for all fans of classic cinema to take note of this release of Sansho the Bailiff. This is a powerful and evocative film, beautifully shot and scored, this is one of the most important Japanese films you are ever likely to see, including Yasijuro Ozu's Tokyo Story and Akira Kurosawa's Rashomon and The Seven Samurai. For those fans of Japanese cinema, do not hesitate to pick this one up. In this case, this film is a must-have addition to your DVD collection. Sansho the Bailiff is the first of six Kenji Mizoguchi films released on DVD by Madman Directors Suite label in April, May and June 2010. This represents an exciting development in the support of English-friendly DVD releases of the otherwise neglected, yet great Japanese director, Kenji Mizoguchi across all regions. Display Samsung LA46A650 46 Inch LCD TV Series 6 FullHD 1080P 100Hz. Calibrated with THX Optimizer. This display device is 16x9 capable. Audio Decoder Sony STR-K1000P. Calibrated with THX Optimizer.